Just like any device, laptops generate heat. They already have a cooling system in place, but because of their small size, the cooling system is also small, and sometimes inadequate in cooling down the laptop’s processor. However, a laptop’s bottom can get so hot it can burn one’s skin. Why does this happen? One cause of a laptop heating up is the inadequate air flow through the laptop’s vent. The vent at the bottom may be blocked by something. Any surface which is not smooth and hard (i.e. human laps, rugs, cushions, bedding, carpet, towels, coats) will almost certainly block the intake grille causing the laptop to overheat and eventually shut down. If the situation gets worse, the laptop will burn out and will be unusable. The laptop’s fan and the rest of its cooling system are very important to the overall operation of your laptop. If the fan stops working and there is not enough ventilation going into the inside of the laptop, the computer will get so hot so fast that it will even crack your LCD screen. When this happens, you must have your fan replaced as soon as possible. And, while waiting for your laptop’s fan to be replaced, you may consider keeping the CD-ROM tray open to allow more cool air to circulate inside the laptop. Sometimes too much dirt inside your computer can hurt your laptop. The processor may not be getting enough cool air because of the dirt that is blocking air flow inside. In many cases, your laptop will shut itself down to avoid further damage to other internal components. But if it doesn’t, you may need to turn it off manually, and seek help from a professional computer repair technician. If it is the battery that is very hot, then DON’T USE IT! A laptop’s battery overheating can cause fires. Lithium Ion batteries are known to explode when they overheat. Immediately have the battery replaced with an original brand. Fake batteries may be cheaper, but they can also be defective from the get go. 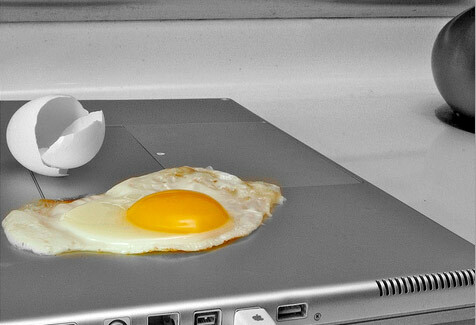 Sometimes a laptop’s brand may be the reason for the overheating. There are a few laptop brands that are sold to the lower-end market. Quality may have been compromised to keep the manufacturing cost low, which will also keep the retail prices low. Selecting the right brand through reading customer reviews and understanding each laptop brand’s specifications is the right solution. Since you know your laptop tends to overheat, do not keep your computer running for a long periods. If you do need to use it, place your laptop on a laptop table which allows air flow through its vent at the bottom. Or you can buy a cooling pad that will keep the processor’s engine down to a minimum. The important thing is to keep the temperature to prevent burn out.